A love story for me? I’ve been in all sorts of stories but never a love story. Name the setting and circumstances and I’ve likely had some experience to it. Lunch with a Chinese billionaire who didn’t speak English? Yes. Skydiving? Yes. Have you driven to the coast? Yes, all of them. How about work? What do you do? At the beginning of this year I wrestled kids for a living. I worked at a placement facility for kids removed from their homes. On my worst day there we called the police six times. I was punched in the face repeatedly, stopped a suicide attempt, chased a runaway for over a mile, broke up a fight, and called an ambulance. This was, in fact, the most stable job I had ever had. I’ll spare you my list of odd jobs, but understand the stress of having yet another job come to a close and waiting for God to reveal the next direction. Waiting? 29 years old and never had a girlfriend. A love story is one that I’ve never been in. In the story that is my life, Love was always a theme and never a character. I entered 2016 with a dim hope for someone I had just met. Dim, because she attended the church that I served in. I was a leader there and I feel strongly that leaders shouldn’t show favoritism or date members of their church community. In January my brother, Peyton, suggested a rather crazy idea that he wanted to start an escape games business and he wanted me to be a part of it. My youngest brother, Sawyer, and I quit our jobs in May to participate. Our goal was to open in June… The contractor we had and eventually fired kept that from happening. Construction was delayed and so was my role for the business. Over the Summer I was jobless again and once again started doing odd jobs to fill in for the lack of paychecks. I worked as a lumberjack for a neighbor for several weeks. It was over the Summer that I truly met Mallory. I first met her on October 31st, 2015. On June 8th we went to Dairy Queen together. I snuck a picture of her with my phone as I was fairly certain this was going somewhere and I wanted to be able to look back on it. (I also have the receipt for our two, mini, strawberry cheesecake blizzards.) It somehow worked out that Countdown Games couldn’t open on time. My schedule had all of the necessary openings to get to see her and know her. On October 31st, 2016, I got permission from her dad to marry her. I proposed on Election Day because she’ll often have that day off from teaching and that makes it more of a holiday. She said yes. It was somehow a very special day and the most natural day I’ve ever had. It felt very right. At Countdown I do odd jobs. It seems strange to me that the work God had me doing years ago prepared me for more of the same in a business with my brothers. Just last week I painted our party room. The ceiling required 15 1/2 gallons of paint. It was miserable work, but it looks great! Similarly, God has used my past as an opportunity to shape me for this relationship. I may not have had a girlfriend before, but that doesn’t exclude me from being the husband I want to be. I was told that dating around would make for important practice. How will I know how to treat “the one” if I have no experience? Terrible advice. I’m incredibly blessed with the fact that there was no line or formula for winning Mallory. It’s likely I would have fumbled it if there was. It is just as likely that no line or formula would have won her. My Story has largely been God and I. We have been through a lot together. He has been the only constant. When family had to be left behind for so many experiences, God was there. I met Mallory in a church in Winchester, Ky. I went to that church having been told I would have a job there. The job never worked out. The money I was promised I found out wasn’t going to be available for my first two months, and after that I found out that my salary was trimmed $9,000 but it wouldn’t be available under a giving defecit was overcome. I kept volunteering for four more months. Wrestling kids at one job to volunteer at the other. After six months I gave up and pursued Mallory instead. Mallory ran the children’s ministry downstairs. For almost two years before I showed up at this church she had been in their basement volunteering. She wasn’t even able to go to church services… She had a job in a neighboring city and landed a job at the new elementary school in Hamburg. I didn’t know where it was, but it turns out she works five minutes away from where I work. God somehow orchestrated me finding her when I wasn’t even looking. He moved us both from unfavorable jobs to a brighter future together in masterstrokes. I refuse to acknowledge fate or luck. God did this. Had I given up on this church because of the money, I would have never met her. Had she not had the heart to serve the kids of that church, I wouldn’t have met her. God used who we are and the steps we have taken to shape us into people who would find each other. I wish I could have listened more when I was younger. I wish I could have been more attentive to what He was saying. Whenever I struggled with loneliness or fear of my future, it’s as though had I listened I could have heard Him saying, “Just wait. You’re going to love her.” Waiting was hard, but she is so worth the wait. After all of the hours toiling with odd jobs, I now have the oddest one of them all. I lock people in rooms to see if they can get out. Things have been going well enough that we’re expanding, and the next room will open in January. I get to work with friends and brothers to make this happen and all of us have certian abilities we provide the group that were crafted through life and experience. Our newest room is Egyptian themed and our workspace looks like a museum and a Radioshack put together. If I could make any sort of point after all of this year and the experience of it all, I would ask that you consider if you are taking any steps at all. I used to feel as though I was in a snowy field and God’s will for me was a boot print I was supposed to step in and I couldn’t find it. Any time I found a closed door it felt as though I had lost His trail and would never get back on course. Today it feels like the snow has melted and I can see footprints in every direction. I’m seeing Him work all things for good, and I do love Him. My love story isn’t about Mallory, it’s about God and me and the way He continually shows how He cares. Yes, I love her, but I can’t begin to love her without thanking Him for her. If you are interested, here are some truths the world argued with me about. You can know what she’ll say before you propose. Maybe this is obvious to you, but I didn’t feel any shock or relief from her response and TV led me to believe that I would be hopeful at best. You don’t have to lower your standards. I was told that I was too picky and that I would never find anyone. I was told that there was no one out there who could meet my criteria and that I would have to be flexible. Standards are what preserve you for the person you wish to marry. Dates can be “boring.”Avoid movie theaters and concerts where you can’t talk. My favorite dates are just sitting and talking. Saying, “I love you” is easy. Mean it. Don’t play games. Every sitcom and romantic comedy would lead you to believe that relationships are built on passive aggressive conversations where people disguise what they feel in order to look cool. I’ve reached a pivotal moment in my faith and I feel it’s worth sharing. I was having a rough day last week. I agreed to mow a field for a neighbor who had abandoned his home. His wife had died and his business floundered. He worked every day for two and a half years to fix his business and he returned to his home this summer to maintain his property. His back field was about five acres and it had grown out of control. I’m guessing the AVERAGE height of everything that had grown was eight feet. Growing along with the grass were briars, blackberry bushes, milkweed, pokeweed, and queen Anne’s lace. Every other plant had thorns on it. My goal was to knock it all down and then mow it a second time to clear the field as much as possible. As I carved into this field it seemed every plant with thorns on it grabbed an arm or a leg, stomach or shoulder, and tore at me before I could stop the mower. Every single time I turned around the wind picked up grass clippings and threw them at me. I was covered head to toe. At one point a thorny bush snagged something as I drove by and whipped free only to slap my leg. Big thorns hit my knee so hard that blood ran all the way to my foot. To add to the onslaught of annoying, the day was very hot, very muggy, and bugs came at me like a porch light. I noticed God had my back. It may be subtle and you may not understand the significance, but I certainly did. Something happened that I’ve noticed in a growing trend whenever I mow in our neighborhood. Barn Swallows showed up. Maybe 30 birds were circling around me and the field, snatching up bugs, and giving me something to watch. Ok, I understand any skeptic’s argument. “Well, there were bugs and there were birds so what’s the big surprise?” Yeah, maybe I was churning up more bugs that usual and drew all of the birds to that field. Maybe. Do you go through life crediting luck, nature, coincidence, and fate? What I have witnessed lends itself to a loving God who looks out for me. A God that I can converse with and thank. A God that I can plead with. A God who writes good stories, and not a roll of some cosmic dice. My big faith moment has been that there are uncounted times He has had my back and I didn’t recognize it because of the duress I was under. So now I’m looking. Now I’m counting and giving Him credit. Now I’m noticing Him at work in little things as well as the big. It serves me well to realize He goes before me into all life offers. There is a game that happens throughout life that consists of measurements. We measure everything to see how we measure up. We start with our height and we progress to who is the fastest, smartest, toughest, and strongest. Who is the most athletic? “Who would win if?…” Sometimes these measurements are played out and a winner is determined, but sometimes a winner can not be named so participants in this hypothetical situation can only posture about what would happen. I’ve seen this played out many times and I’ve often been baited into these scenarios. Rappers, boxers, singers, sports fans, celebrities all participate. Who has more money? Who is more popular? Who would win in a fight? We desire to be more than we think of ourselves and more than others see. We boast about what we have and who we are to feel more secure about our place in the world. I work with kids who have nothing. Nothing. They win NONE of these measurements. On a global, regional, city, or even city block they won’t win any of these measurements. . . . but they still measure. They still posture and boast. They’re not anywhere near the smartest person in the room, but they put others (even adults) down as though they know more. They have no money, but they’ll brag about donated clothing as though their taste is better. They made fun of my shoes, even though theirs were a gift. It’s the human condition on display. Poor kids or Hollywood millionaires, it’s a sad presentation. Christmas day I worked with these kids. I think of people like this a “Takers.” These people want to take some of who you are so they can feel better. This is just the beginning of the things they will take if you let them. One person I was working with was in trouble for his actions, and I enforced the ramifications of his deeds but he put it on me. He had no regard for the bad way he had been measured. He blamed me for why he was being punished. He said, “It’s Christmas!” as though that should allow him mercy. He tossed my religion at me, as though the meaning of it should let him off, without regard for the creeds of that religion. I drove home from work dumbfounded by what I had seen. Someday we will all stand in judgement. Givers on one side and Takers on the other. We will be caught in our transgressions and our measurements. The extent of who we are will be laid out in front of us. No more posturing or exaggerating. We will be naked in our guilt. There will be a time we have NOTHING. There will be ONE thing to claim and that is Jesus. Will you claim him or toss mercy in His face as though that is what you are owed. Do you deny Christ and still claim mercy from him? I think people, “Takers”, will look upon God someday and say “if you can’t be merciful to me, then you’re not God.” They will have missed the grace extended to them. A Taker’s only role models are those who’ve taken more than them, and Jesus gave more than he ever had. It’s weird, I know, but hang with me. This may be the most glorious “first world problem” you ever read about. First, I needed to go back. That was step one. Step two was to pack a boat. I live in Kentucky, so to purchase or rent a boat in Colorado and carry it into the mountains a few miles would be too much. So I settled on a raft. A raft needed to be inflated though, and that’s difficult at 10,000′, so an air pump would be necessary. What next? Well, snacks, oars to paddle around, some sparkling apple cider and champagne flutes, music, and maybe a towel? I went back. I flew back to Colorado with everything fitting within the 50lb weight limit. I get to the trail with my pack loaded for the trek to the lake. I hiked it in and immediately started laying out the supplies. I get to the bottom of my bag, to the raft and pump. (I checked the batteries before I left.) I begin pumping up the raft only to find there was a hole in it. Just kidding, it filled. I threw in all of my junk and pushed off. I brought bluetooth speakers to play music, and I’m proud to say AWOLNATION’s “SAIL” echoed off of the water. I ate Chips AHOY cookies. We paddled around, ruining pictures other hikers were taking as the lake no longer reflected anything but some idiots in a boat. I suppose I should come to a point? . . . Sometimes what makes sense to us won’t make sense to others. Christians are called to charity, compassion, forgiveness, and so many other things that are difficult in light of the World’s darkness. I know I’m making a huge leap here. I’m not saying everyone should start inflating rafts (even though that would be fun). What if we adopted the absurdity of the Gospel as the preferred way of doing things? What if we loved people like we’re supposed to instead of closing some out because they’re unfamiliar? If you are anything like me you are all too loving on your pets. Fight for their affection, pet them, feed them, clean up their mistakes, and I even make up little songs with their names and sing them when the house is quiet. Only to go out and get ticked off at some human who cuts me off in traffic or messes up my order. Which is more absurd then? The Gospel is taking something made beautiful and returning it to it’s place of honor. It’s absurd and backwards and it’s right. Be weird. Go be different. By all measures of “The American Dream” I am a failure. This isn’t a plea for help. I don’t need a morale boost. I was on the road to “the dream” when I left college in 2009, but here I am still in my parents’ house, driving the same car, no kids, no job, and no picket fence. Understand, I’m not completely pathetic. At the drop of the hat I could produce several hundred character and professional references. I’ve turned down as many jobs as I’ve been rejected from. Churches I’d like to work for won’t hire me, and the ones that like me I don’t. A “Jack of All Trades but a master of none,” it’s been explained to me that I have no marketable skills, but a laundry list of things I could do. Since I graduated college I’ve done odd jobs for people. I’ve washed windows, house-sit, dog-sit, cat-sit, substitute taught, mowed lawns, and gardened. I’ve reviewed books, spoke for church camps, drove a truck, done demolition, sealed a driveway, pressure-washed, painted houses, painted fences, painted a pool and a horse fence. I raked leaves and made a website in the same week. I worked at Sears Auto Center. However you want to phrase it, I wanted an adventure. I wanted a good story to tell with little concern for what happens to the storyteller. I wanted to go do something different, and so I did. I set out to do one somewhat different thing each month. I was to do at least one new, strange, uncomfortable, wonderful, inexplicable thing each month and have a story to tell. Others called it a mid-life crisis. I drove to California with my friend, Graham. We drove for 38 hours over three days. We had amazing Texas barbecue. We stopped at the Grand Canyon to see the Sunrise. We went to Disneyland. Doesn’t every coming-of-age story involve a drive across the whole country? I surprised some friends in California and flew home. In February I started writing a book. I came up with a story and started typing it out. I have no idea when it will be finished, but it has been a fun process to work through. It took quite a bit of initiative to start, and as I’ve gotten busy it falls dormant, but I have kept with it throughout the year. I’ve never made up a story with so much depth before, and it has been a fun way to escape at times. In March I went to Hawaii on a mission trip. Our team of three orchestrated a camp for several churches on the island of Hawaii without youth staff. I’ve never had to ask myself, “how close is too close to lava?” Now, this was a legitimate mission. We met some great people, worked hard, and had fun. 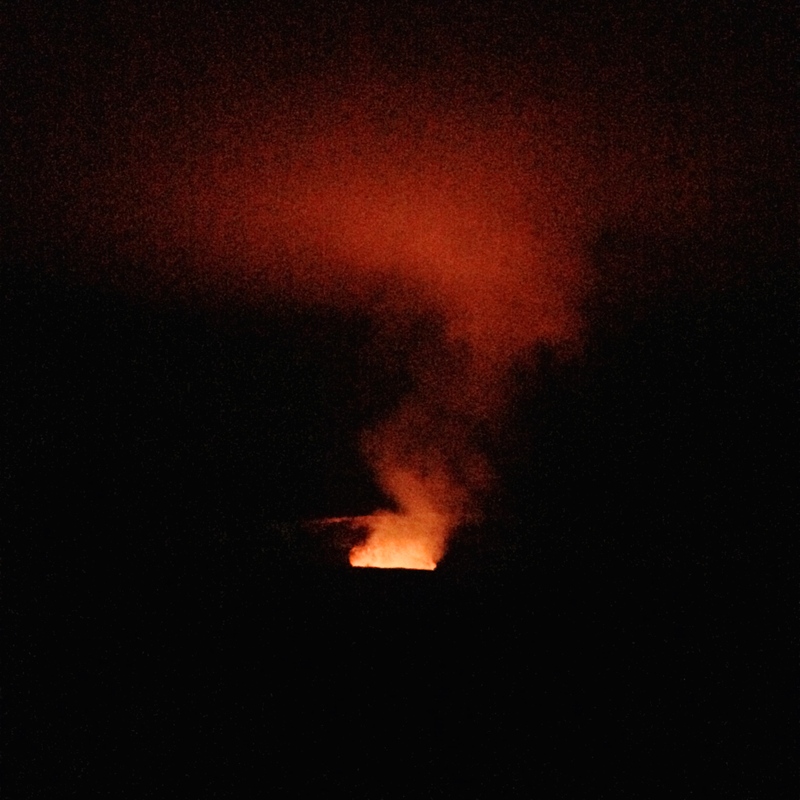 We played night games under the red glow of the volcano. We hiked across a volcano crater that is still hot, constantly billowing steam from the ground. I went snorkeling at Kahalu’u Bay, once rated a top 10 snorkeling spot in the world. I stood at the southern most tip of the United States. I also got a 10 hour flight delay at the Hilo airport where a kind lady microwaved pizza for me. In April I went to Central Asia on another camp team trip. I met some awesome new friends, ate some interesting things, went shopping at a mall with over 3,000 shops, and visited a museum celebrating the fall of Constantinople. I can’t say too much more about this trip. Sorry for the lack of detail. 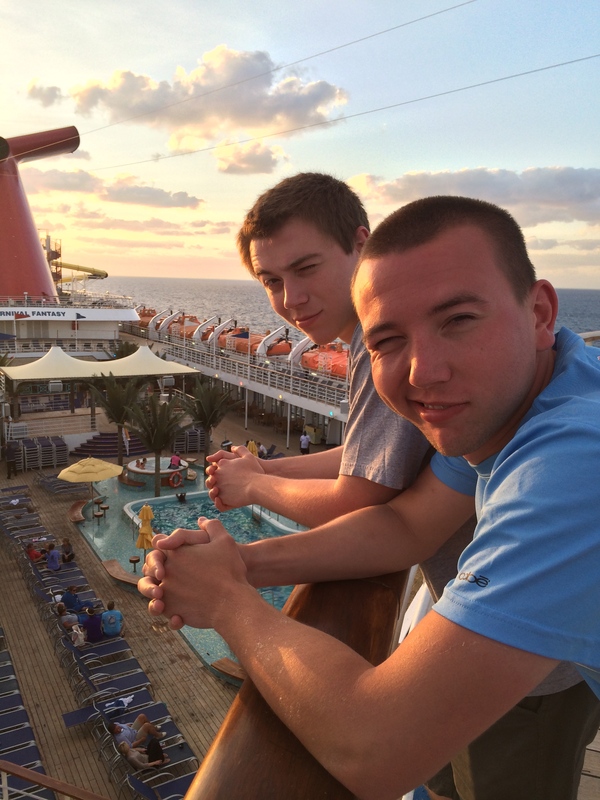 One night the boat hit some waves and the pool, which was about the size of a large bathtub, sloshed water out. Sawyer and I watched it for about 10 minutes until we started laughing at how bored we were. In June I got on a Bone Marrow transplant list. No word on any matches yet, but this was big for me to make a decision to endure some pain and discomfort for someone to have another chance at life. It’s sort of a no brainer. Giving bone marrow is like giving blood, it replenishes! I do have a little panic attack every single time I see an email from them. In July I went skydiving. I asked some friends and family to see who was interested in going, but everyone backed down. So, I went by myself and left it a surprise for everyone. I put the video on a TV for my family to watch, and I watched their eyes get really big. 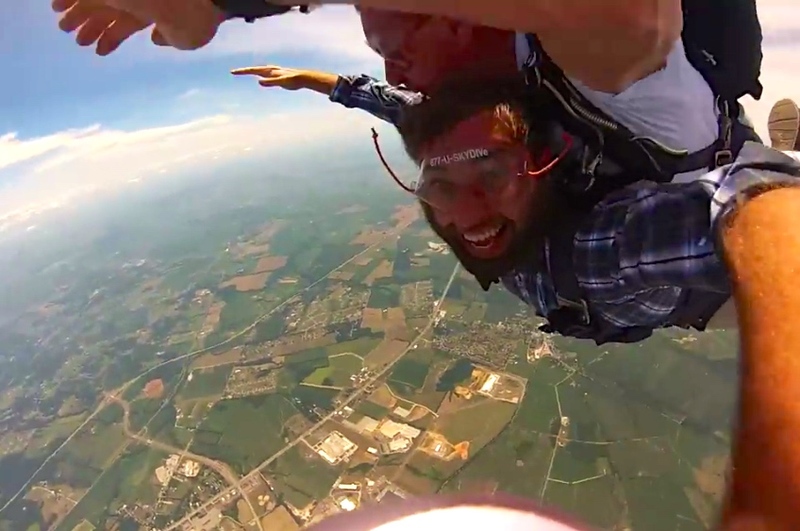 I jumped out at 10,000′ and pulled the chute myself! The guy I jumped with had jumped 6,943 previous times. He even let me steer to the ground. By the way, people ask, “why would you jump out of a perfectly good airplane?” Well, it wasn’t. The pilot was wearing a parachute also. In August I started running. I hate running, but I decided it was going to be worth it for my September activity. I got some “Couch to 5K” app on my phone and ran all month long. Every other day I ran around 2.5 miles. I ended up straining my calf muscle, which put September in jeopardy, but it was enough. 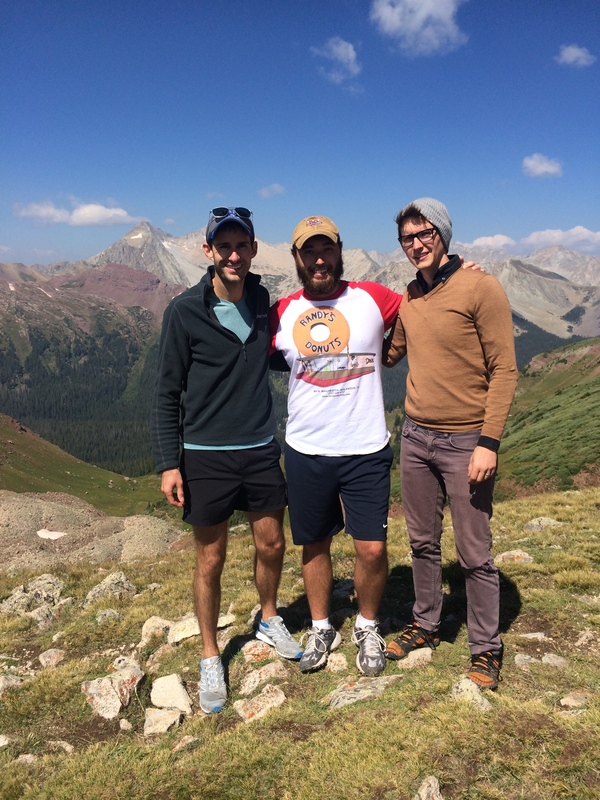 In September I attempted, yet again, a hike that defeated me in years past. The hike starts around 9,500′ and goes up to 12,500′ and back down. 10 miles round trip, we finished in about four hours. It was exhausting, but I finished without even needing a nap, where before I once just laid down off the trail and slept for an hour and a half while our group continued on. After eight years of visiting this same trail I finally made it to the top. In October I was in a music video. My brother, Peyton, came up with the idea of recreating the Gangnam Style video for my parents for Christmas. So my four brothers, sister, brother-in-law, nephew, a camera crew Peyton hired from Asbury University, and 85 volunteers participated. Peyton even arranged a friend of his to film a “behind the scenes” video showing our choreography practices. Peyton did all the work, and even edited it himself, but I had to dance, and that will suffice as something difficult for me. In learning the choreography, my brothers were having to use TaeKwonDo stance terminology to teach me what to do. You can watch the video here. 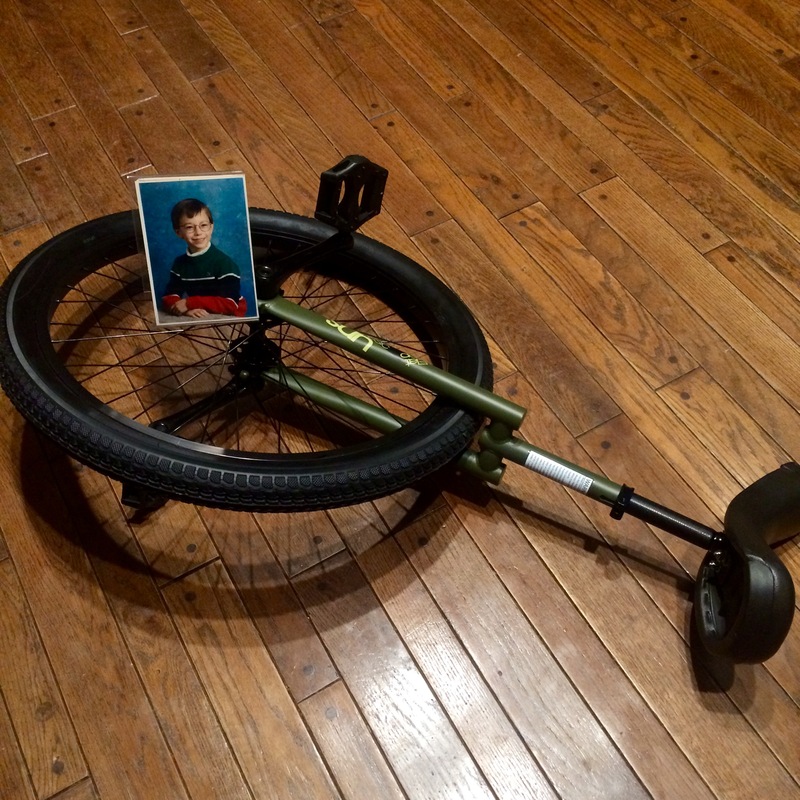 In November I bought a unicycle. Here is a picture of me on the unicycle. Unicycling is impossible. I’ll continue to work on it, but imagine leaning back in your chair too far and instead of grabbing the table, you have to pedal your feet. What a good thing to fail at! I’d much rather fail at unicycles than skydiving. In December I joined the handbell choir at church. Ever since I was five years old I thought it looked fun. Now at 27 I seized my opportunity. I was the only male in the choir. Some women brought their own gloves . . . We performed after three practices, and minutes before our Christmas program started my A bell started to break. (It is crucial to We Three Kings) My whole family and some friends were in attendance. There you have it, my mid-life crisis. At the start of this year I wanted to look back and tell the story of all these crazy events. Now I feel as though these events aren’t a very good story. Jumping out of a plane is a difficult story to tell as there was no drama. The real story there is that I am the sort of person that will jump out of a plane. I was driving in the Arizona desert at night, pulled off the road, and killed the lights. Graham and I got out of the car and looked strait up to see the stars. This scenario played out many times this year as I saw the stars from a boat in the Atlantic, a volcano in the Pacific, a mountain in Asia, and from a hot tub in the Rockies. I did lots of new things this year. I joined a new church. I started volunteering for their youth department. I became a group leader for Bible Study Fellowship. I drove a truck for Food Aid International, following a Christian Concert tour. I’m not the biggest fan of Christian music, but every night of the tour closed with this song. How do I sum up a year like this? 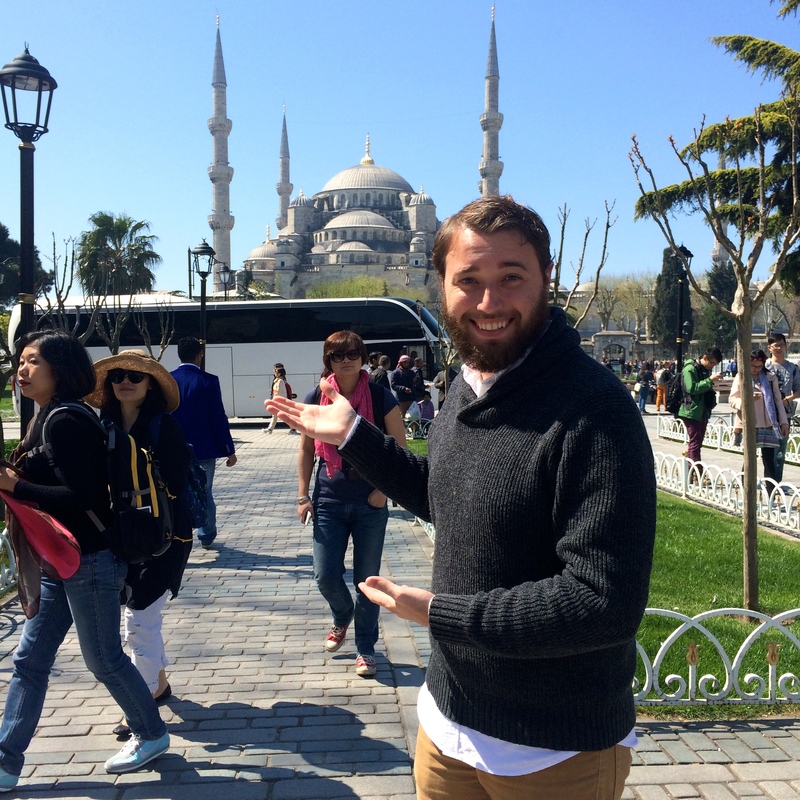 While eating lunch in the biggest Muslim city in the world, a man approached me and asked if I was a Christian. When I said yes he turned his back and walked away. 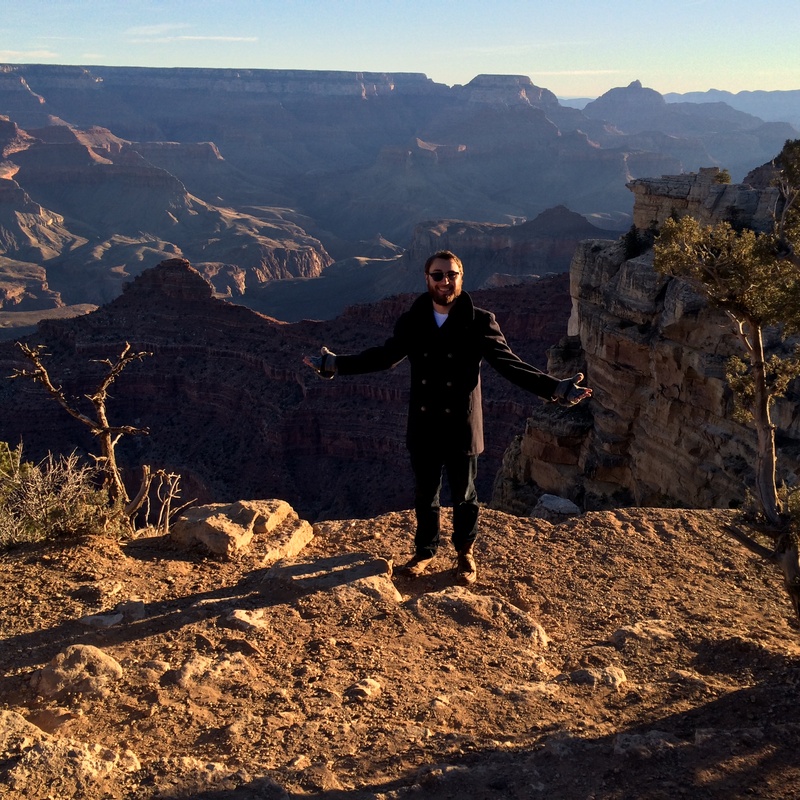 When I saw the sun rise over the Grand Canyon I heard the crowd quiet themselves. I went camping, was rained on the entire time and slept a total of three minutes. Where can I begin to tell you what this year was like? What do you add to your bucket list when something gets scratched out? If I could encourage anything after a year like this, I’d say, “try something new.” It doesn’t have to be expensive or foreign, but new. How long will you put something off that you’ve desired to do your whole life? How long will fear win out? It was statistically safer to jump out of the plane than to drive to the airport. Sometimes the plan God has for us is safer than what we have for ourselves. The plan I had for my life 10 years ago is no closer today, but as I’ve turned to acknowledge God’s plan for me I’ve found He had a better story to tell. 2014 was a year I chose God’s dream rather than my own. Whatever God has in store for 2015, I’m excited about it. P.S. Don’t post everything online. It is way more fun to share your life in person than through social media. I kept the majority of my year off the internet and feel it gave me more to talk about in person. I’m coming for you. Carpe Diem and all that. For all that my 26 years have thrown at me, I face you prepared for a fight. I leave 2013 bruised but strengthened and all the more capable. I learned in TaeKwonDo how to face multiple opponents and I’ll face you in the same way, one at a time. I enter each day as a toughened victim who has found the solution to a bully. I don’t fight alone. Ignore the fact I’m difficult to knock down and you have to contend with those who lift me up. Disregard my friends and face the fact that I’m redeemed to God, who binds you up and limits your blows to what I can withstand. Tomorrow is within my strength and you can’t bring the next day yet. You have a definite end and I will relish in every day of your demise. The difficulty in choosing a white elephant gift is deciding how good or how bad you want it to be. If your gift is just “bad” it will be unwrapped and not stolen. If your gift is horrific it may be stolen a lot. If your gift is only “good” then it won’t be stolen, but if it’s amazing it will be stolen a lot. In choosing a gift you have to decide if you want to go good or bad. So if you’re walking through your house looking for something to contribute, don’t grab the Barbie, grab the creepy doll that will haunt your dreams. Don’t opt for the ordinary because the more odd and random the better. Creativity is always good for laughs. I once received a “Tic-Tac-Toe Kit” which consisted of a pen, paper, and 20 or so drawn tic-tac-toe boards. Other personal favorites of mine were “How to Speak Kingon” instructional CDs, old family VHS tapes, and a book on grammar. The truth is every person’s gift plays a part in the success of another’s gift. Contribute something terrible and it will make someone else’s gift more desirable. By contrast your gift may become the best or worst option. The goal should be to offer something unique in order to have variety. I once gave a 40lb. lump of coal. In years past I’ve given a frozen Turkey, an enema kit, and a bed pan. Take something people will remember and you can’t go wrong.